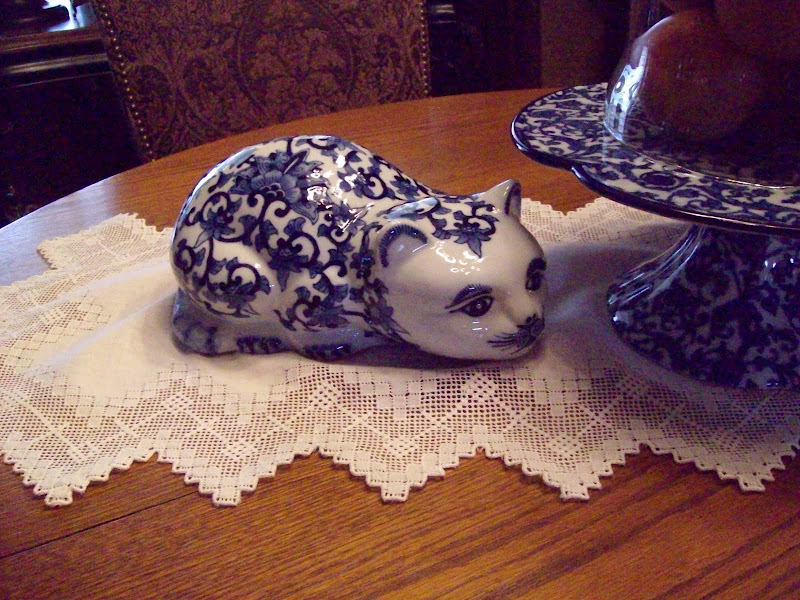 Lynne's Gifts From the Heart: A Kitty on the Table?? A Kitty on the Table?? 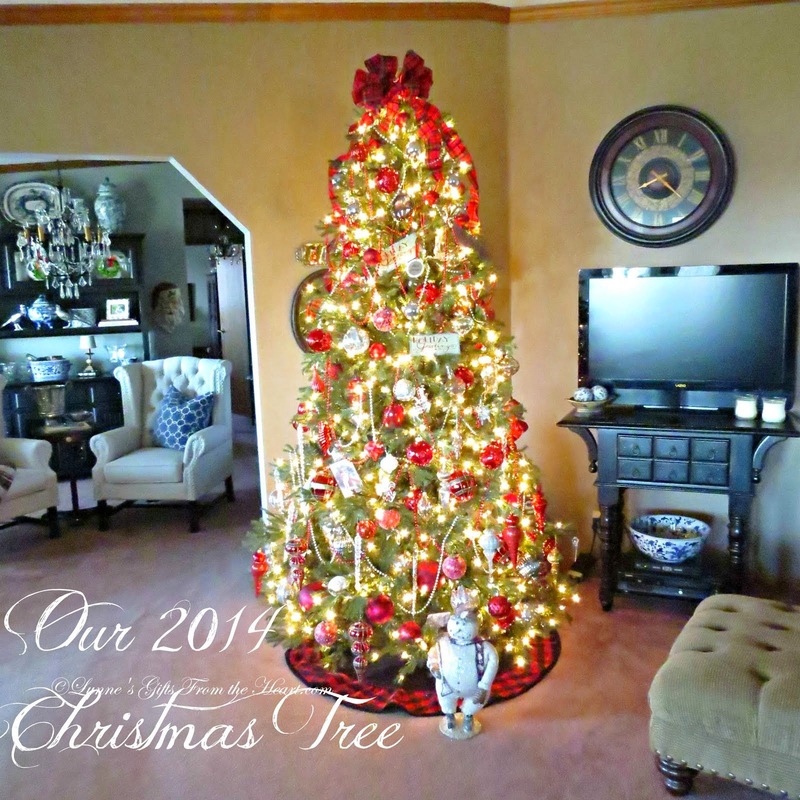 Welcome to Tablescape Thursday hosted by Susan at Betweennapsontheporch. It's always a delight each week to see all the beautiful tablescapes. There is so much talent out there in blogland and we're fortunate each Thursday to see a lot of them. 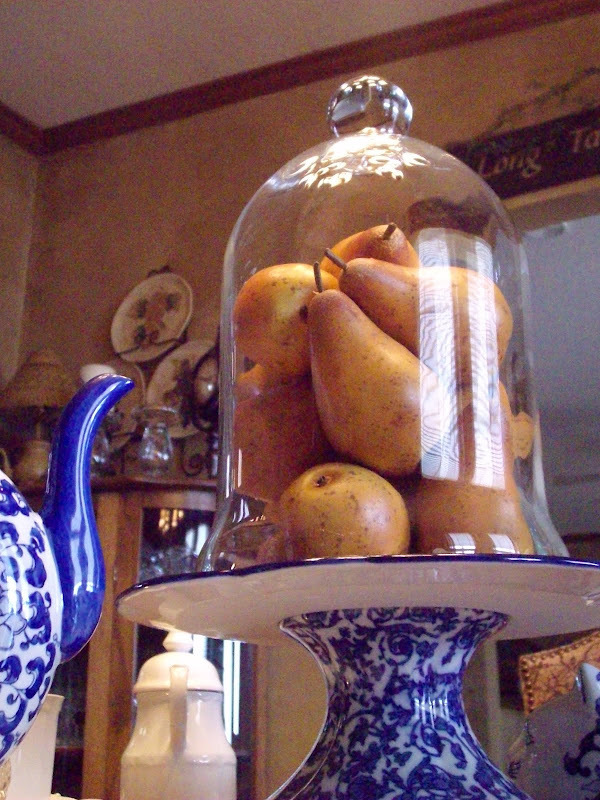 I've chosen the cloche dome full of pears as the center piece. The cake stand was a find at TJ Maxx quite a while back. 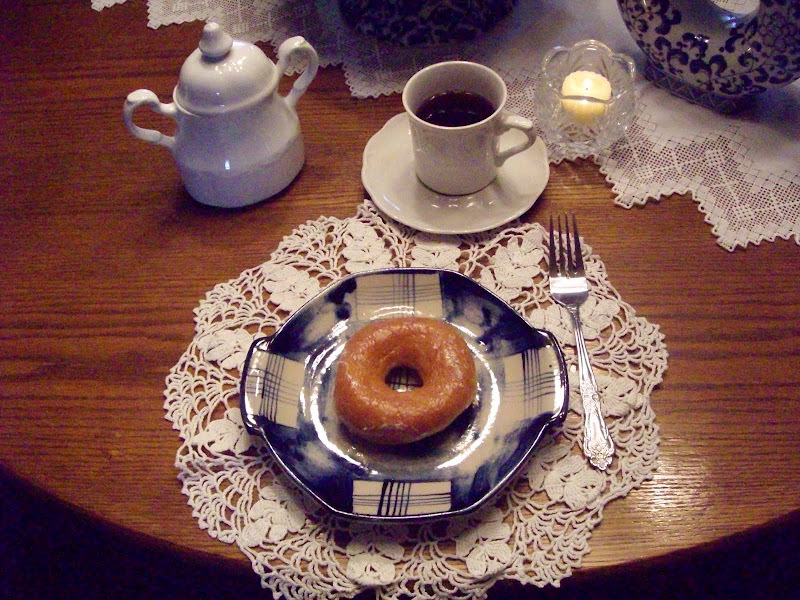 I've put out a donut and cup of coffee just for you. I've had Miss Kitty for a long time. I'm not sure I remember where I got her, but fell in love and she had to come home with me. 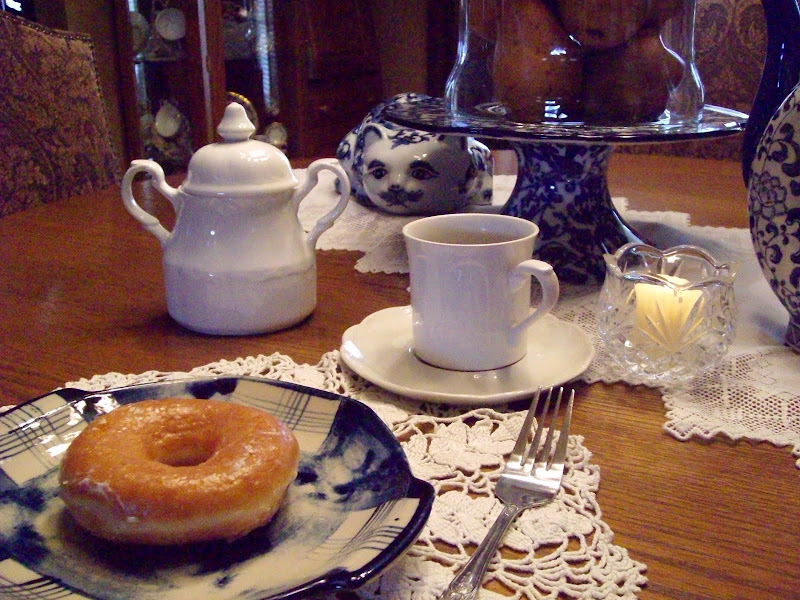 The sugar bowl, cup and saucer is Meakin and was gotten at a friends sale many years ago. 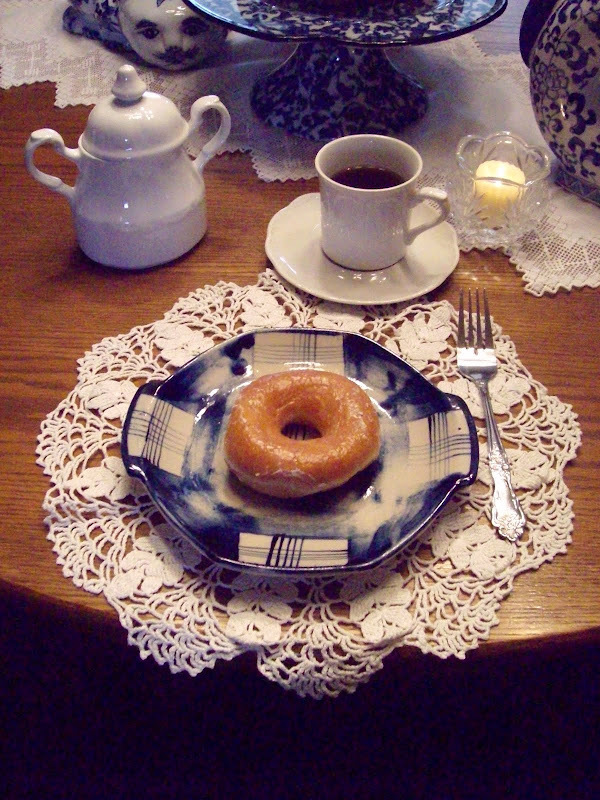 I used an antique doily as the placemat. The plate was found at Hobby Lobby on their 80% isle. That's been a while back. Miss Kitty is certainly persistant isn't she? Now, we see why. She was after this adorable mouse. I'm sure many of you recall seeing this little guy other times. 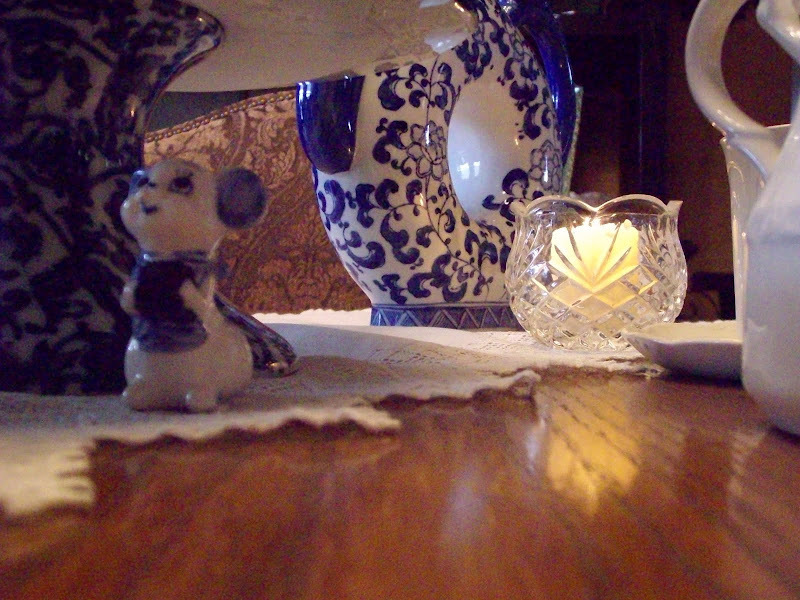 I honestly can not remember where I got the adorable little mouse, I've had it for many years. I'm sure the mouse is singing high praises or praying for Devine Intervention. Thanks for swinging in today. I've enjoyed you stopping by. 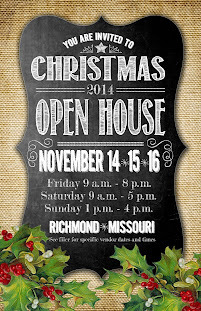 Be sure to treat yourself by swinging over to Susan's for a full list of those participating. I'll see you there. Lynne, You did a super job on this tablescape. First of all I love kities, secondly your dishes are absolutely to die for beautiful and third, I haven't had a donut in a long, long time! Truly, this is so pretty. I love the addition of the golden pears all snuggled in under glass. Your photography is super! I have a T/S ready to post in just a bit! Hope things are going well for you and yours. You've created a very nice presentation for Tablescape Thursday! 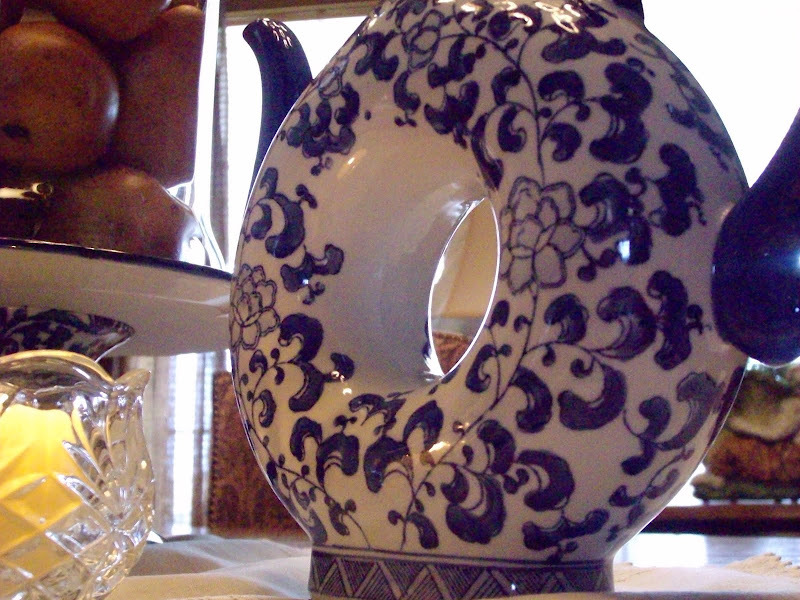 Beautiful blue and white for your table. I loved your series of photos...very cute! Hi Dear Lynne! Oh, I remember this tablescape. Now that's a good kitty to have - no fur balls or cat hair! You know no matter when you did this, it's still very pretty! I hope all is going well with you and Mr. P.this week. 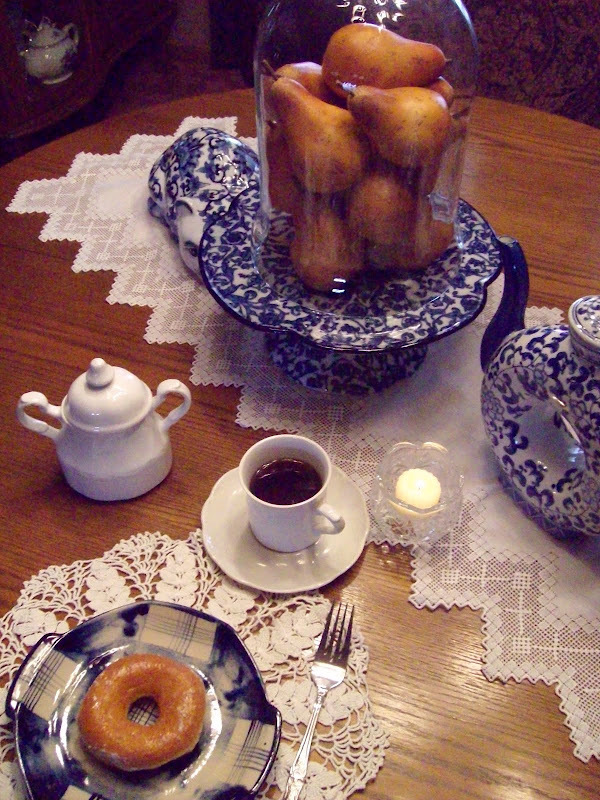 Ok, I'm ready to sit down at your beautiful tablescape, and have a cup of coffee,donut, and good conversation. 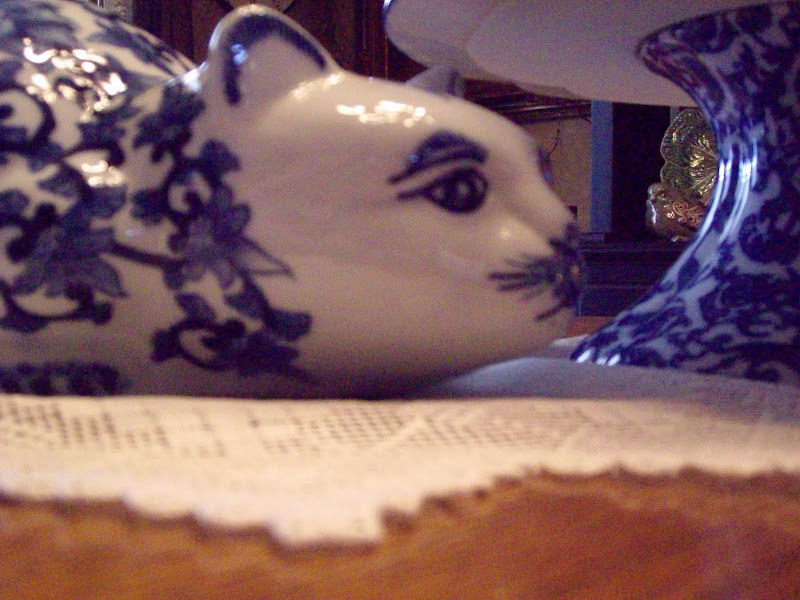 I love the blue and white pitcher and the kitty ........ so pretty! 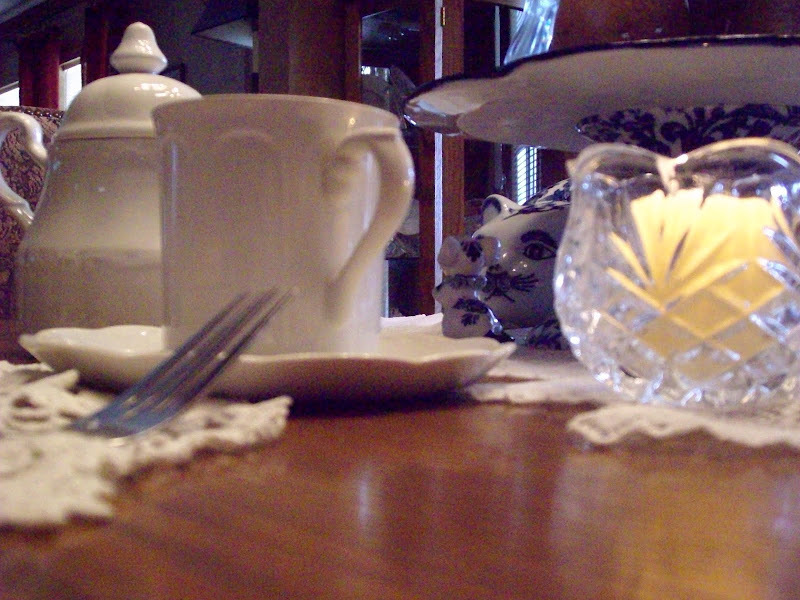 Lovely tea setting for kitty. 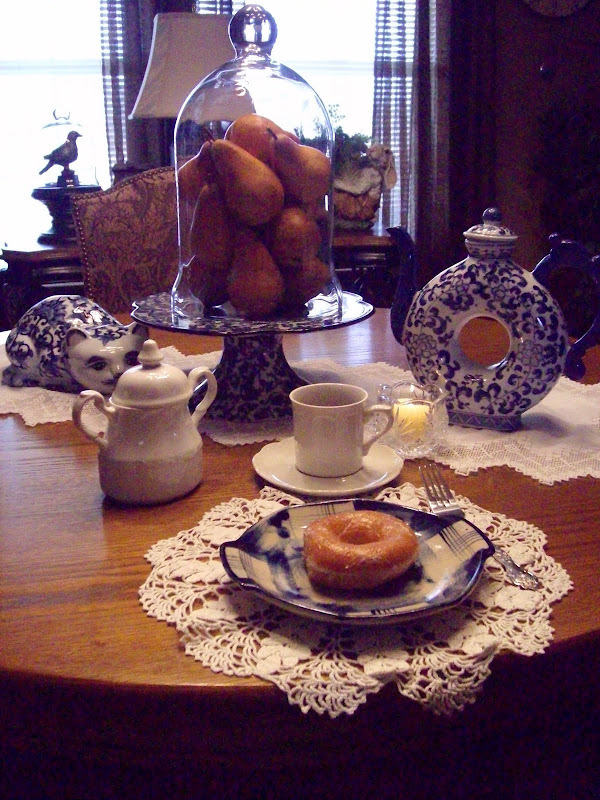 I have a few of those blue donut tea pots....your table is just so beautiful!!! I must have missed this the first time around--I would remember it, especially that teapot! The cat looks like me about to lunge at a doughnut! Beautiful! 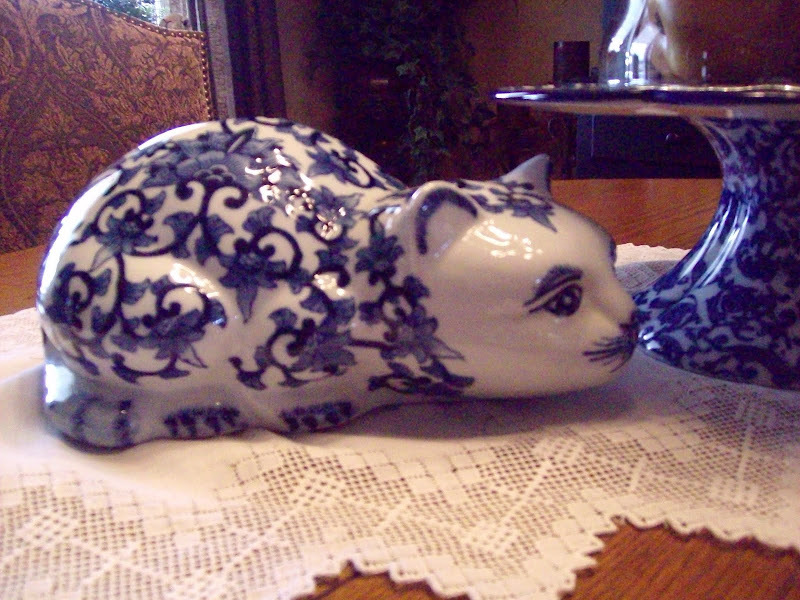 Oh Girl you know you had me with the blue/white...I ♥ that tea pot that your sweet Catie got you and that kitten is about the cutest thing girl...Now I so remember that mouse at Christmas time it was all over your house...Thanks for sharing my dear friend...Love ya sis...Hugs and smiles Gl♥ria...oh don't be mad at silly me but I did a copy cat from you ha ha!! Lynne, This is such a beautiful table. I am not a fan of cats, but I sure could live with this one!!! 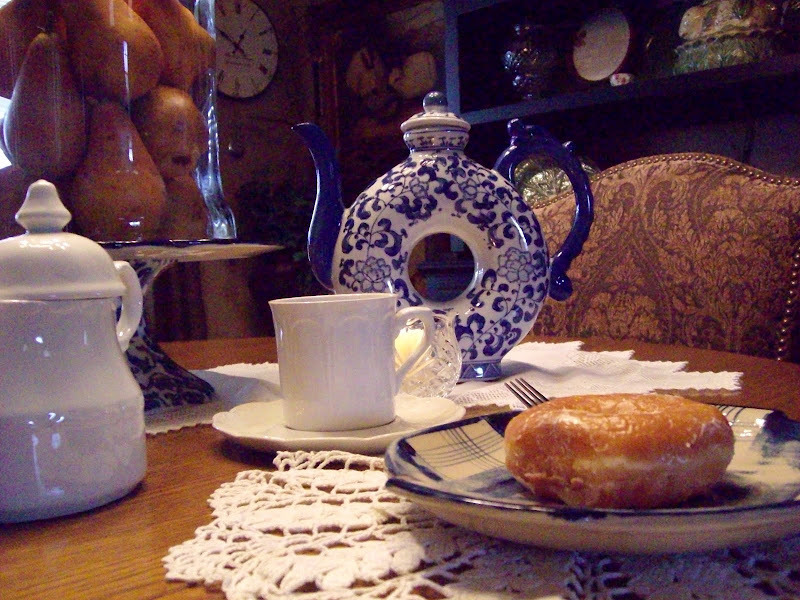 The blue and white plates are so unusual...as it the teapot. Great taste...and beautiful tablescape! I'm enjoying a nice cup of coffee as I read but sure do wish that I had that donut!! I remember this tablescape...vividly. 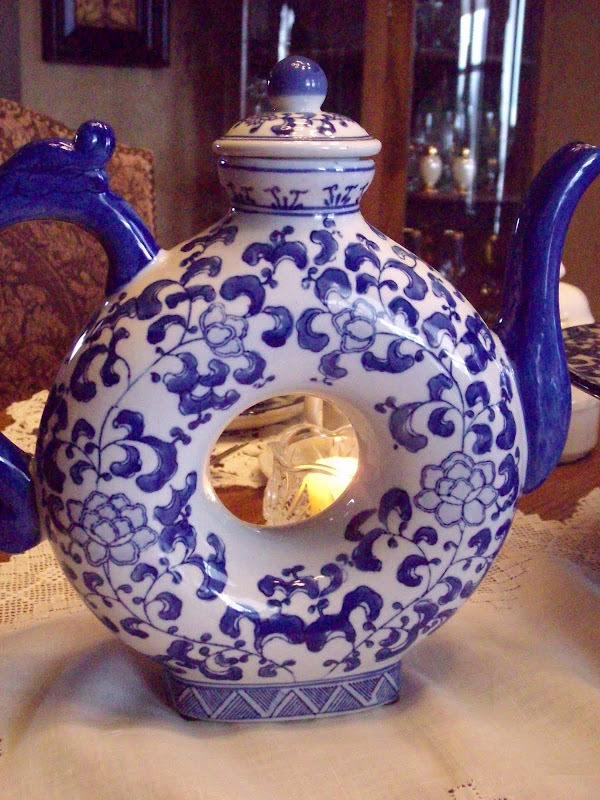 I just love that teapot...what a TREASURE. Beautiful as always. You have a Award waiting for you on my blog. Please stop by to accept it. Ah Lynne I remember this one! I just loved the sweet kitty and mouse. So cute! PS Everything is going much better for me! Thank you for coming by and asking. I appreciate it. Lord only knows how long I'll be without it, so I'm not adding anything to my blog. I've been spending a lot of time on Facebook, getting reacquainted with old friends and even some family, and meeting many new ones. When asked by a girlfriend to join, I did, but didn't pay it much attention. However, now I find it very entertaining and lots of fun re-living some childhood times. I'm so pleased to hear that your husband is doing better, I bet you can breath a little easier now. THANK GOD. I've been spending a lot of time tending to my dog, he was operated on to have lumps removed and looks awful from being shaved, but is doing very well. I'm spoiling him, I know he will be my last Collie and I just want to keep him around as long as I can, he was eleven this past March. Be well my friend and take care. That teapot is somethin' special! how cool is that thing?! 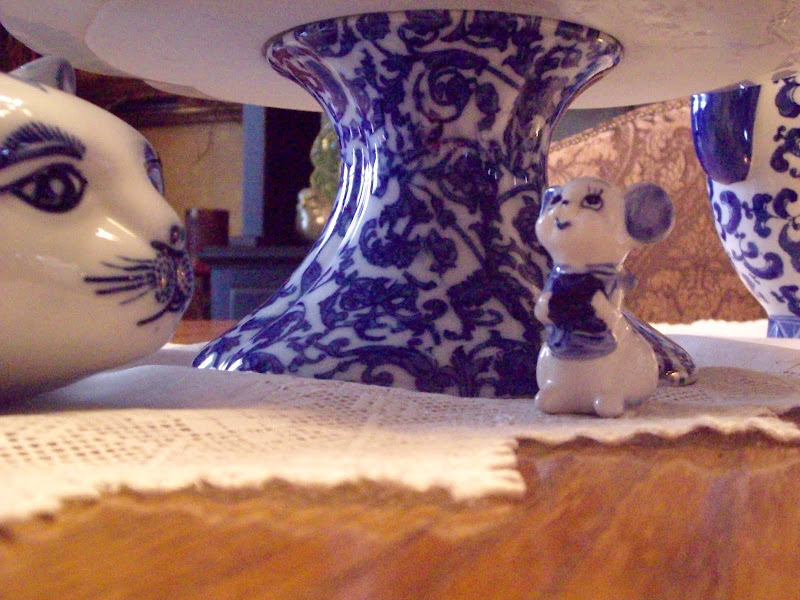 I also love the yellows of the pears matched with the blues in your china. A perfect color combo!! Great job, always a treat! This is really cute. I remember the cat and mouse. You know what though....now I'm so hungry for donuts! Have a fantastic night. WOW! I really love this setup, rather "tablescape"! My cousin would just love this. Her mother is into interior decorating. The pears in the cloche dome! 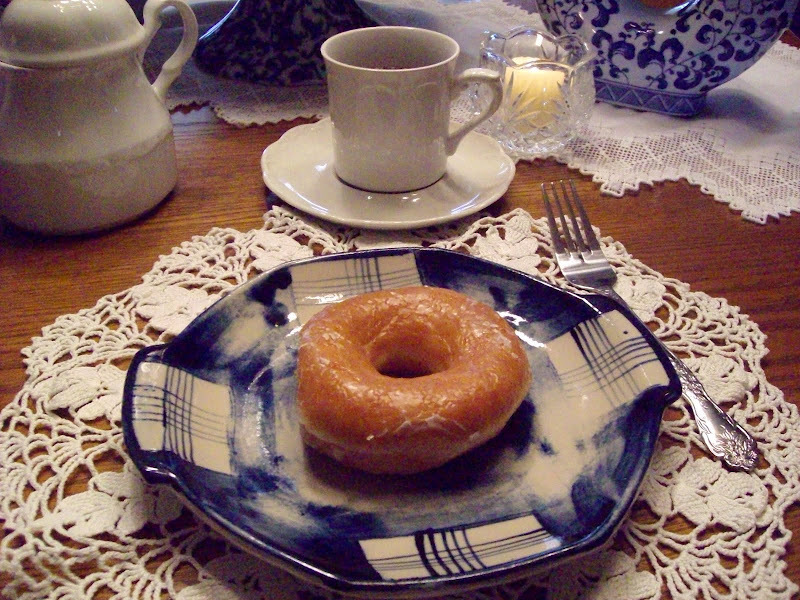 I dearly love the plaid dishes, they are so pretty. 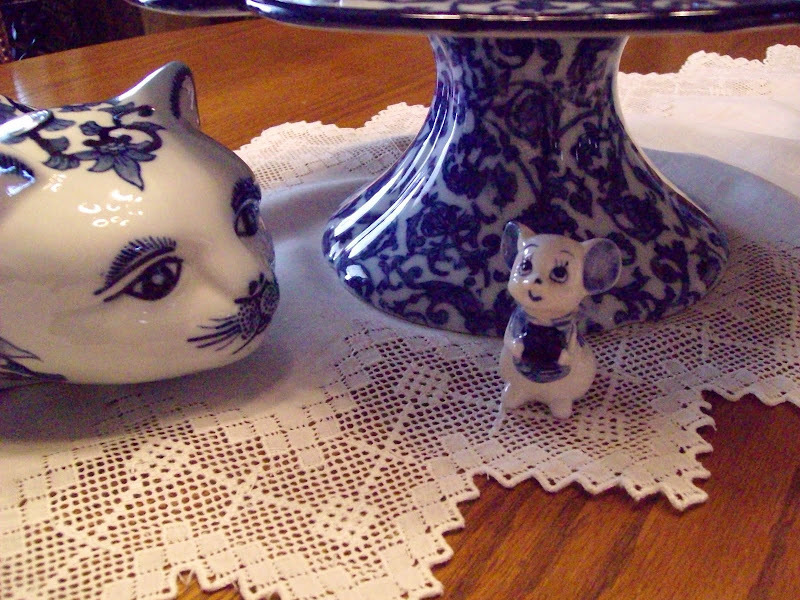 Lynne, this is the cutest tablescape ever! I love the kitty after Mr. Mouse...so cute! And you know how much I love blue and white! Beautiful table...sunshine for my eyes!